Massimo Gon started playing the piano when he was 5 years old. He studied at the Music Academy “Giuseppe Tartini” in Trieste with Luciano Gante. After the diploma, for which he was awarded a special mention, he studied with Vincenzo Vitale in Naples for a short period and subsequently attended Nikita Magaloff’s summer courses in Geneva. Following a series of highly praised performances in national (Premio Venezia, Cata Monti di Trieste per la musica moderna e contemporanea, La Spezia, Osimo) and international competitions (Stresa e “Viotti” di Vercelli), he was invited to perform in some of the most important concert venues in Italy (Teatro alla Scala, Teatro Regio di Torino, La Fenice, Filarmonica Romana, Teatri Verdi di Trieste, Teatro Massimo di Palermo), in several European capitals (Moscow, St. Petersburg, Budapest, Ljubjana, Brussels), in the United States and in South America. He participated to several international festivals (Mozart Festival, Serate musicali di Stresa, Mittelfest di Cividale, Estate Fiesolana, Asolo Musica, Alghero). He has recorded for the Brussels-based label Empire Master Sound and has recently published a CD for Velut Luna with the integral cycle of Liszt’s 12 Grand Etudes. He has a predilection for the romantic and twentieth century repertoires with a particular eye to contemporary music, having on several occasions presented compositions never previously performed. He is a teacher at the Music Academy “Giuseppe Tartini” of Trieste and is regularly invited to give Master Classes (Cajkovskij Music Academy of Moscow and the Liszt Academy of Budapest). 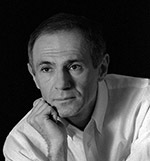 He has been a member of the jury in several important music competitions.